Poultry Evaporative Cooling Pad are used in most of the Poultry Farming and Poultry Industry. Poultry Equipment consultants and fabricators always trusts on economic and best cooling conditions with Cooling Pads. As hot air passes through the Evaporative Cooling Pads a stream of cool and refreshing air is produced. Evaporative Cooling Pads are developed to provide exceptional wetting properties and air flow to achieve optimum cooling capacity and maximum durability. Our cooling pads are your best choice! Cellulose Cooling Pads differs from typical traditional air conditioning systems and Evaporative cooling Pad works by employing water's large enthalpy of vaporization. We are providing our clients an excellent quality Evaporative Cooling Pad. The offered cooling pads are manufactured with the help of premium quality raw material and technically advanced machines in line with industry standards. 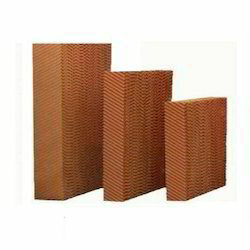 Product DescriptionWith the help of our state-of-the-art infrastructure unit, we are able to manufacture superlative quality of HONEYCOMB EVAPORATIVE COOLING PAD that is offered in various specifications as per the needs of our clients. The offered range is designed and manufactured using the optimum quality basic material as per the set industry norms. In addition, the basic material our professionals use to manufacture these products is of best quality. 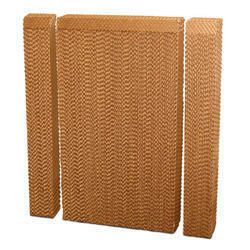 We have carved a niche in the industry by manufacturing and supplying a commendable array of Celdeck Cooling Pad. In order to eradicate the production defects, these products are thoroughly tested on defined parameters of quality. Our offered pads have gained admiration from every nook and corner of the country for their remarkable quality and durability. These products can be availed from us in different specifications options at leading market prices. Celdeck Cooling Padis the ideal and most economical method of cooling. Celdeck Cooling Pad is the process in which air is cooled by using the heat in the air to evaporate the water from an adjacent surface. A temperature reduction of 10 to 20°C (50-68°F) can be achieved by passing the hot fresh air through the wetted pads. The temperature reduction depends on the dry bulb and wet bulb temperature of the ambient incoming air, the thickness of the pad (in the direction of the air travel), the geometry of the pad, the air velocity through the pad and provided the proper amount of water is used and distributed evenly so that all of the pads are wet through their depth, height and width. The hotter and drier the incoming air, the higher the temperature reduction, after passing through the wetted Eaporative Cooling Pads. 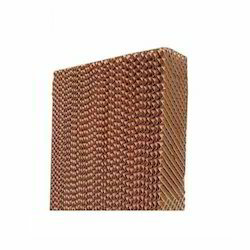 Product DescriptionProduct DescriptionBeing one of the renowned organizations in the industry, we are highly engaged in offering a unique range of Cooling Pad Use Industrial Offered cooling pad is manufactured under the guidance of our adept professionals using the quality grade basic material and high-end technology. 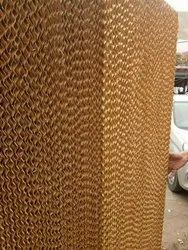 Provided cooling pad is available in different sizes as per the variegated demands of our valuable clients. In order to avoid any flaws, this cooling pad is stringently tested by our quality experts against various quality parameters. 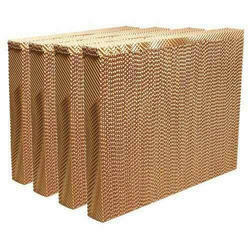 These Media Evaporative Cooling Pad are used to keep the Temperature Down by Air Conditioning.These are made of using superior quality raw material to ensure that these are in compliance with international norms and standards.Our Cooling Pads offer long serving life,made by using specially Ripper Process. AC Evaporative Cooling Pads that is Manufactured using sophisticated machines and advanced technology.Also,we ensure that only high-grade basic material is used in the manufacturing process of this product. Moreover,we also provide our clients with customization facility of this range in order to meet their variegated application requirements.Our quality controllers inspect this range on diverse aspects to ensure its flawlessness. Color: Green, Brown, Black etc. 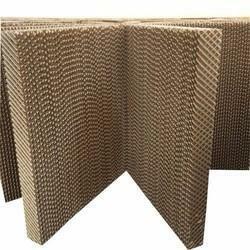 Made of Cellulose Corrugated Paper has high intensity structure with insoluble chemical compounds, corrosion resistant, long service life. Specific stereoscopic structure, it will provide largest evaporation surface area for heat exchange between water & air (approx 460 m2/m3) which provide excellent cooling effect.scientifically designed flute angle (45/45) directs water towards both the air inlet and outlet side; the water then intrinsically flushes away dirt algae and mineral build up on the evaporation surfaces. 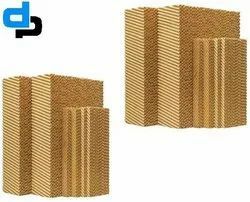 With the help of our experienced professionals, we Manufacture and export a large assortment of Dirt Resistant Cellulose Pad that are made using cross corrugated Cellulose Paper. These products are used in Different Applications of Poultry, industrial and Horticulture sectors. 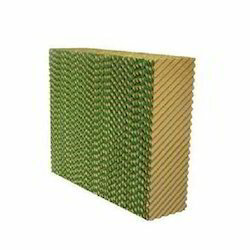 Our Cellulose Pads are capable for absorbing and retaining water in order to provide excellent Cooling Efficiency. 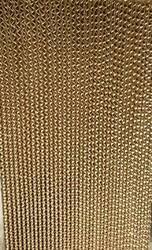 These are coated with the help of rigidifying wetting or anti riot resins. 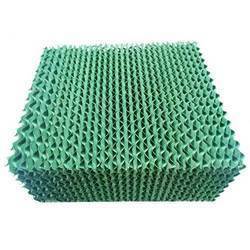 Cellulose Pads For Chillers Cellulose Pads For Chillers for Poultry are used in most of the Poultry Farming and Poultry Industry. Poultry Equipment consultants and fabricators always trusts on economic and best cooling conditions with Cooling Pads. 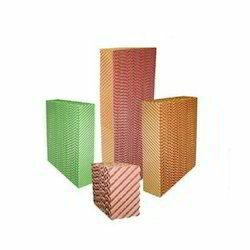 Evaporative Cooling Pads are made of fluted Cellulose Sheet those are glued together. Cellulose Sheet is treated with unique ingredients to achieve high cooling efficiency & degradation resistance. As hot air passes through the Evaporative Cooling Pads, a stream of cool and refreshing air is produced. Air Cooling Pad are developed to provide exceptional wetting properties and air flow to achieve optimum cooling capacity and maximum durability. Our Cooling Pads are your best choice. 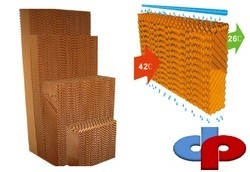 The Cellulose Pads For Chillers as a device that cools air through the evaporation of water. Cellulose cooling pads differs from typical traditional air conditioning systems and Evaporative cooling works by employing water's large enthalpy of vaporization. Poultry Farm, Greenhouse & Horticulture industry, Vegetable Storage,Mushroom Farming, Seed Farming, Floriculture, Poultry & livestock. 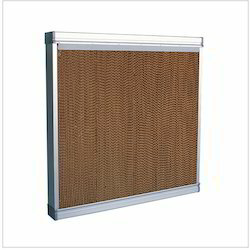 Evaporative Cooling with Evaporative DP Cooling Pad in India is the ideal and most economical method of cooling. Evaporative Cooling is the process in which air is cooled by using the heat in the air to evaporate the water from an adjacent surface. A temperature reduction of 10 to 20 degree C (50-68 degree F) can be achieved by passing the hot fresh air through the wetted pads. The temperature reduction depends on the dry bulb and wet bulb temperature of the ambient incoming air, the thickness of the pad (in the direction of the air travel), the geometry of the pad, the air velocity through the pad and provided the proper amount of water is used and distributed evenly so that all of the pads are wet through their depth, height and width. The hotter and drier the incoming air, the higher the temperature reduction, after passing through the wetted OFFI pads. Why Evaporative DP Cooling Pad in India ? Our clients can avail from us a high grade quality range of Yellow Green Evaporative Cooling Pad for Greenhouse. These Evaporative Cooling Pad For Greenhouse are available in various sizes and specifications. Our Clients can buy it from us at competitive prices in standard as well as customized shapes and sizes as per their requirements. 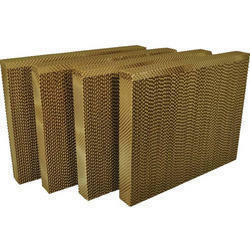 Our organization is involved in offering Air Cooling Pad, which is available in various thickness, width, and height. 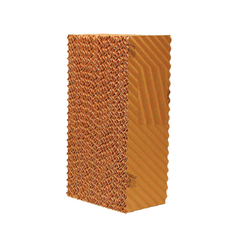 These are made from specially treated flute media, which are capable of absorbing and retaining water in order to provide maximum cooling efficiencies. Our range ensures to provide the greatest performance during summer seasons. These Cell Deck Pads For Greenhouse are available in various sizes and specifications. Our Clients can buy it from us at competitive prices in standard as well as customized shapes and sizes as per their requirements. 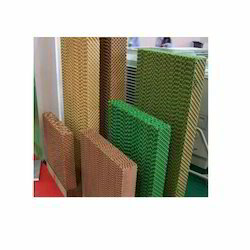 Our clients can avail from us a high grade quality range of Green Brown Cell Deck Pads For Greenhouse. 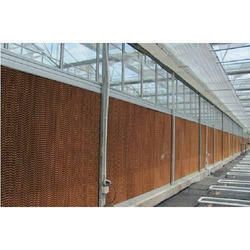 These Cell Deck Pads For Greenhouse are available in various sizes and specifications. Our Clients can buy it from us at competitive prices in standard as well as customized shapes and sizes as per their requirements. 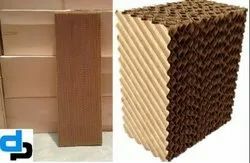 we manufacture our own high-density, cross-corrugated ChillCel Cellulose Pads.They're matched to your cooler for maximum effect. Our ChillCel pads provide the highest cooling efficiency of any Evaporative Medium. On average, ChillCel Pads are around 4"-8" thick,which we believe provides optimum efficiency.Other brands may claim that thicker pads provide better cooling. The facts are that only a certain amount of water can evaporate into the air Thicker pads cannot make any more water evaporate unless the pads themselves are quite inefficient to begin with. Thicker pads may require greater power to draw the air through,a larger pump to move the volume of water required and provide an ideal environmnet for efficiency sapping salt and mineral buildup. In other words, they probably cost more to buy, more to run and need to be replaced more often. 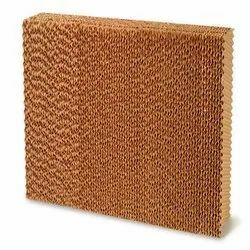 We are providing a commendable array of Cellulose Pad. 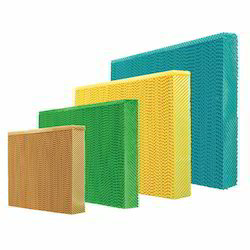 These Cellulose Pads are suitable for retaining or absorbing water for providing maximum cooling air. The water is collected below the bottom of the pad and is re-circulating again by a pump through the unique distribution system. 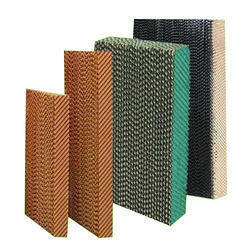 Our offered pad is widely admired by the clients for its good absorption and high cooling efficiency. 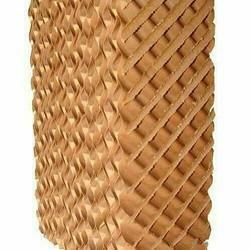 These cellulose pads are provided at industry leading prices. Chillcel High Efficiency Pads We are strong, long-lasting Chillcel High Efficiency Pads that last for up to seven years, maintenance is easy. 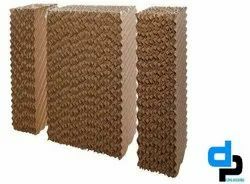 Chillcel High Efficiency Pads are made from organic paper materials, cleverly manufactured into Chillcel High Efficiency Pads that have excellent structural and cooling strength. They are easy to clean and replace when necessary. Seeley International has been using Chillcel High Efficiency Pads in our products for decades, so they have a proven track record. Backed by a team of well qualified and experienced professionals, we are engaged in offering the wide array of Evaporative Cooling Pads to our respected customers. 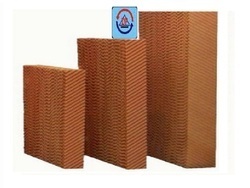 These offered pads are used in systems where high efficiency cooling is required. In order to manufacture these products, skilled professionals use the high-quality material. 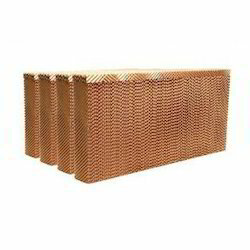 Our Company is one of the trustworthy names in the market for offering a wide assortment of Light weight air Cooling pad.These products are cross corrugated coated with anti-rot, rigidifying and wetting resins. Additionally, these offered pads made for maximum efficiency at minimum pressure drop. 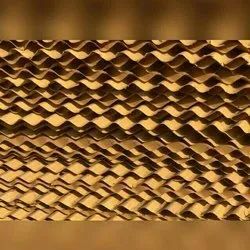 Evaporative cooling pad also known as Cellulose or Celldek Pad are made of cellulose corrugated paper glued in an opposite sequence, which generates air passage inside the pads. These sheets have very high ability in absorbing water and are chemically treated to prevent disintegration. Cooling pads are energy saving, environmentally friendly and economically viable as they reduce temperatures without gas emissions . 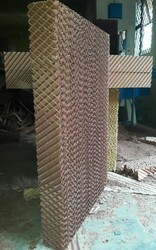 Apart form manufacturing the fans for various applications, D.P.ENGINEERS make the Cellulose Pad,made by these Thailand and Italy various companies in India and are well established with respect to Poultry, Horticulture (Green House) and Industrial applications. 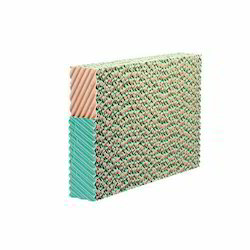 The Evaporative Cooling Pad (ECP), made of cellulose paper is engineered from cross-sectional, specially treated flute media capable of absorbing and retaining water to provide the maximum cooling efficiencies. 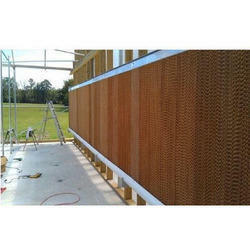 The cellulose media is treated with stiffening and wetting agents to provide the cooling without any water carryover. The pads are designed for tropical and subtropical countries, ensures greatest performance during summer seasons. 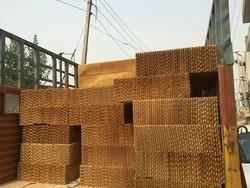 The Cellulose Pad is cross corrugated coated with anti rot, rigidify wetting resins. The 150 VAPUR Pad are made for maximum efficiency, at minimum pressure drop.The pad media is treated with anti-rot and rigidify resins. The media is cross-corrugated to maximize the mixing of air and water. Saturation efficiency ranging from 50 to 98% can be achieved depending upon air velocity and depth of the cooling pad. 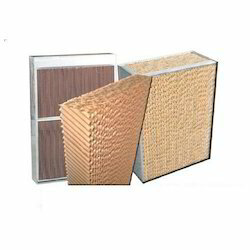 D.P.ENGINEERS make Evaporative Cooler system this system is efficiently backed up by the cellulose pads that in turn amplifies the efficiency of the system on a whole and thus provides cooler air in the required area. 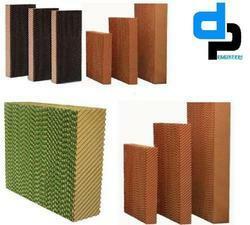 Looking for Evaporative Cooling Pad Wholesales Supplier -DP ?